Some new Injinji socks arrived – two pairs. A liner toe sock, and a heavier outer hiking sock. Both fit well, and are very comfortable. These won’t be available until fall, but we were lucky enough to get a sneak peak! The liner is a lightweight sock, with individual toes. The fabric is soft, and has enough stretch to be comfortable, without sagging after a couple hours of wear. 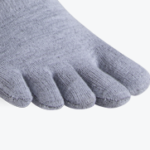 I have worn toe socks before, and could always feel them between my toes, due to excess material, or them becoming stretched out over time. Thankfully, the Injiniji socks have enough recovery and hold their shape, so once I’ve put them on, I no longer feel them. The outer sock, is a heavier hiking sock, most likely perfect for cooler weather. It has a nice amount of cushion, without being bulky. They come up to my mid-calf area, and stay up even after walking around for a couple of hours in loose fitting clogs. I didn’t find that my feet perspired while wearing them in 65F temperatures. For the most part, I will be wearing them over the next few months while hiking in Maine and New Hampshire. I’ll be looking to see how they hold up, if wearing a liner helps prevent my feet from perspiring, does it wick moisture away from my feet, and do they maintain their stretch recovery. For the Hikers, I’ll be watching for how well they maintain their cushion, do they stay up after a long day of wear, and how well constructed they are. Our temperatures fluctuate very frequently, with average temperatures in June/July ranging from 40F at night, to 90F during the day. Finding the right socks for that range can be a trick. I don’t like being overly warm, but I also want my feet to be comfortable. 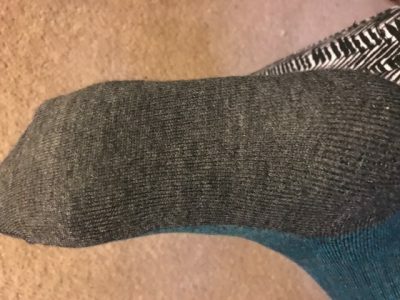 I appreciate the opportunity to review these socks, and will be updating this review in about a month, after some real life hiking use. After an estimated 100 miles or so one the liners, and probably twice as much on the outer socks, I have to say that these are some well made socks! I took them to Iceland with me, and although the temperatures were cool – between 45-60F the whole time, it was damp quite a bit also. I don’t mind cooler weather, but was wondering how the dampness would play out with my feet. The socks kept my feet dry, and very comfortable. I wore the liners with the outer socks most of the time and found that combination to work well. On drier days, I left the liners off so I could wash them and they could fully dry out. We did some climbing, along with hiking on paths and the socks stayed right where they were supposed to. No sliding or bunching. I’ve worn them for local hikes, and find them comfortable even in warmer, humid weather. I do find that the liner socks feel damp after a hike, but my feet don’t feel particularly damp. They do a decent job of keeping my feet dry, by wicking the moisture away. One of the most surprising things was how much loft the outer socks kept after wearing for multiple days. They always had that ‘cushion’ feel that really keeps them comfortable. I did take them off at night to air out, and gave them a shake or two before putting them back on. While traveling I washed them by hand, but I do throw them in the washer at home, on cold and air dry in the dryer or on the line outside. They show little sign of wear, and even the color is the same was when I first received them. 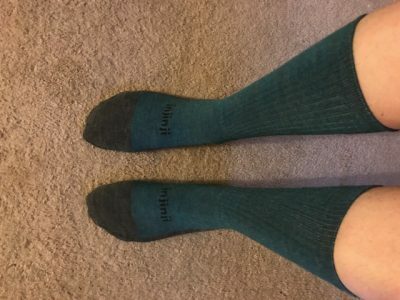 Thanks to Injinji and 4alloutdoors.org for the opportunity to review these socks!